Not included in this collection, but the Islands, Scotland collection, is a set from the distillery on Islay's neighbour Jura, Isle of Jura distillery. There are so many pictures it's difficult to pick favourites. Still, the seemingly endless Ardbeg distillery - warehouse, the Bowmore distillery - warehouse # 1 / living wall, the Caol Ila distillery - still in front of the sea, the view of Kilchoman distillery from above, John at Laphroaig distillery - cutting peat bog and this ‘Owl’ at Lagavulin distillery (what's the story here, anyone know?) caught my eye. 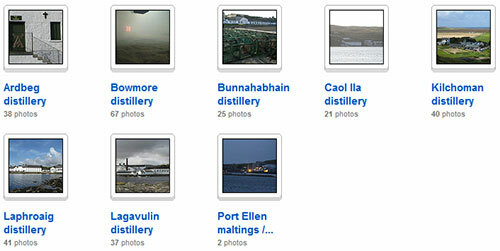 I hope you'll enjoy Alexandre's pictures and find something you'll like or which reminds you of your visit(s) to an Islay distillery or two.